The small Silky Terrier ran down the hot dusty road desperately trying to find water and shelter. She didn’t know why her humans left her. Her throat was parched from thirst, and her body ached with pain. The dog came to a used car lot at the corner of Dillon and Palm Drive in Desert Hot Springs where she sought refuge underneath a car, but the scorching sand beneath her paws raised her body temperature even higher. It was Saturday, August 15, 2015, and the temperature in the scorching Coachella Valley summer reached 119 degrees. Ironically, it was International Homeless Animals Day, but there was no relief from the intense desert sun for this suffering homeless Terrier. Local animal advocates were alerted to the dog’s plight. Jo Venegas-Cebrun contacted Cathie Coats who rushed to the site. 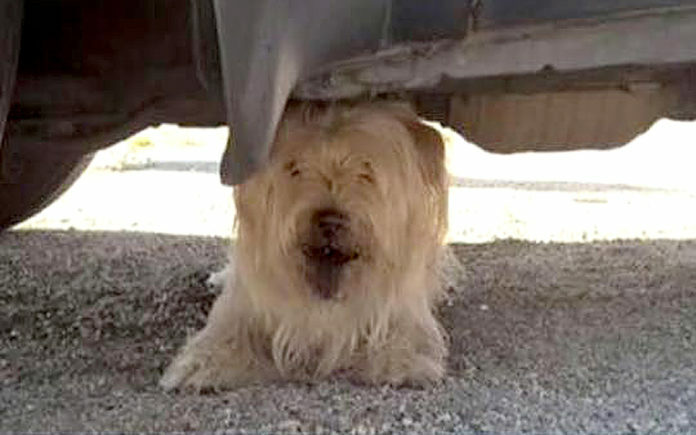 Cathie crawled underneath the car only to discover the dog had just passed away from heat stroke. 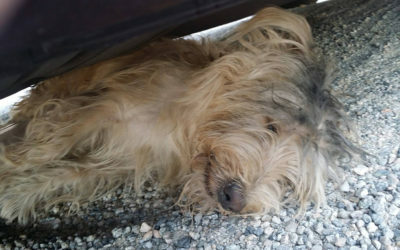 Cathie recalls, “I was heartbroken, this dog is the face of neglect, this dog is the face of what heat does to animals.” The Silky Terrier was another sad casualty in the battle to save homeless animals, the car where she sought refuge becoming her final resting place. Jo Venegas-Cebrun wanted to pay tribute to the dog she named Summer. This dedicated “rescue warrior” drove to Desert Hot Springs to retrieve Summer’s body, determined the Terrier would receive the love and dignity she may not have known in her short life. Jo took the dog to a pet crematorium, and keeps her ashes in a memorial tribute. Summer’s death and photographs went viral on Facebook where animal lovers posted sad and angry comments. Her story was featured on KESQ televised news. Rescuers gathered in memory of the little dog they never knew. Countless “outdoor only” dogs are suffering during this scorching 2018 summer. Some have perished without any public attention. Summer’s legacy will be to convince pet owners that it is unacceptable to have “backyard only” dogs in the blazing Coachella Valley summers. Overheating can result in irreversible kidney, heart, liver and brain damage. Dogs cannot sweat the way we humans do, as their only sweat glands are in their nose and on the pads of their feet. Imagine being thirsty and drinking out of a scalding hot water bowl. Imagine being a social, loving creature, and spending endless days isolated with no other living being. Why do some people keep their dogs outside? Some people were raised by parents whose admonition, “Dogs belong outside” still rings in their subconscious. Others grew up on farms where animals were routinely kept outside and used to herd livestock. Their country of origin may be one where keeping dogs outside is common practice. Some dog owners may need assistance with housetraining. What can you do to continue Summer’s legacy? Talk to people who think their dogs should be outdoors 24 hours a day. You will only make them defensive if you come across in an accusatory manner. Calmly ask them why their dog is always outside. Provide them with information on heat stroke. To start off, suggest they get a baby gate and keep their dog in a kitchen or laundry room during the hot days. Share Summer’s story. Meanwhile, enjoy the companionship and unconditional love your best canine friend provides INSIDE YOUR HOME! Previous articleLe Vin Tour de France 2018!